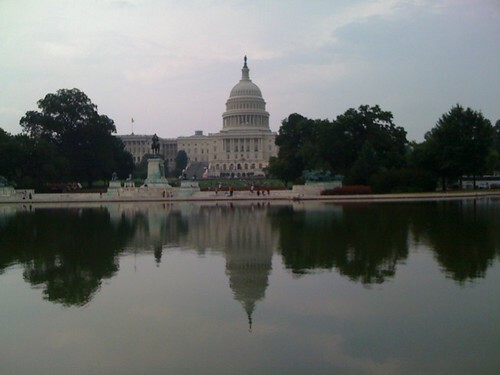 Last week I had the opportunity to visit Washington D.C. without it being primarily a business trip. Before going, I decided that I wanted to spend my four days there visiting as many of the museums and galleries as possible. I also wanted to visit a few other institutions that were either associated with the Smithsonian or not part of it. Over the four days I was there, I visited the African Art Museum, the Air and Space Museum, the American History Museum, the American Indian Museum, the Freer Gallery of Art, the National Zoo, the Natural History Museum, the Renwick Gallery, the Sackler Gallery, the United States Botanic Garden, the National Gallery, and the Newseum. That’s an average of three institutions a day! I’m happy to say that I had a great time visiting these museums, galleries, gardens, and zoo. It was a great way to spend a relaxing, fun vacation, and I learned a lot. As I walked around these institutions, I was really impressed with the fact that I live such an incredibly luxurious life. While I’m just an academic who heads up an honors college, I have the incredible luxury of spending the better part of week just touring museums and the like, not caring about anything taking the time off work or paying for my hotel and meals. I feel wonderfully lucky in life. Rather than write about each museum in a separate post, I’ve decided to group the museums alphabetically into a few posts that will briefly summarize my thoughts on each institution I visited. 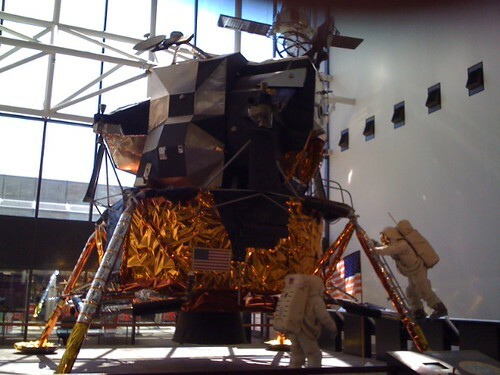 In this post, I’ll write about my visits to the African Art Museum, the Air and Space Museum, and the American History Museum. 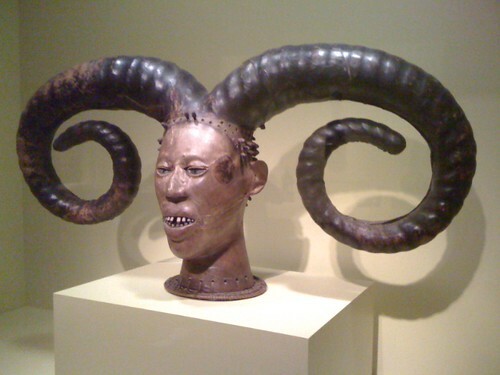 This was my first visit to the African Art Museum, which is a small little museum that is connected to the Sackler and Freer Galleries, both of which specialize in Asian art. It’s a very interesting museum. The exhibits are well presented, and I liked the arrangement of the galleries. This mask is beautiful, but it’s also interesting because it uses human skin to cover the head of the figure. It’s from the early twentieth century, and the description made it clear that the tribe from which this piece derives, probably the Efik people, are one of the only groups to use skin in this way. I also really liked that the museum’s fliers were very helpful. 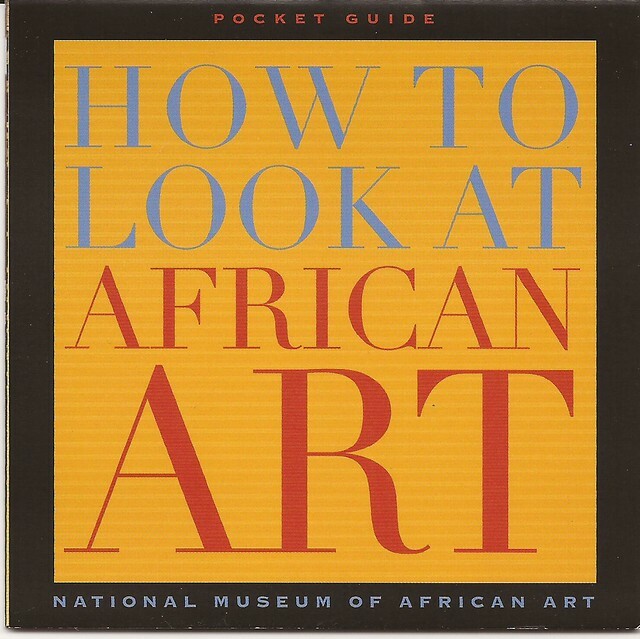 This flier, How to Look at African Art, for example was a little, pocket-sized guide on what to look for in African art. This includes such things as proportions, gestures and expressions, what kind of material the object is made of, what the surface of the piece looks like, its colors and patterns, the relation between form and meaning, and any spatial relationships you can see in the work. While these elements are fairly common sensical, I liked the reminder and concrete advice on how to better appreciate the pieces in the museum. It’s a handy little piece of information to have with you as you walk through the museums — more museums should produce their own versions of this pamphlet. This largish room contained works by these two artists. The way this exhibit works is that the two artists meet and then produce work in conversation with one another specifically for this exhibit. It’s an interesting way to produce work, and the result was fascinating. 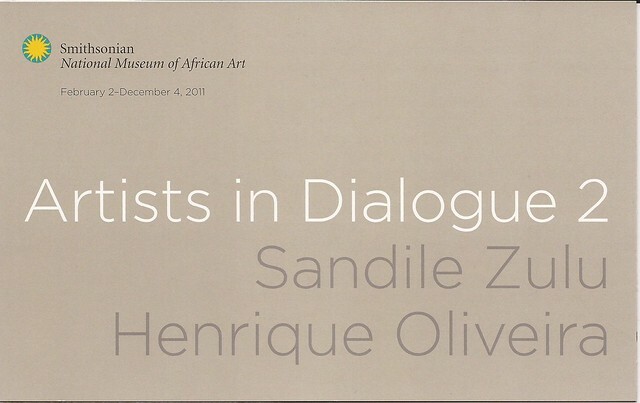 I don’t usually like huge, contemporary sculpture/installations, but Brazilian artist Henrique Oliveira’s Bololô works for me in the context of Sandile Zulu’s paintings in this room. The exhibit runs through the beginning of December, and you can also find descriptions and videos about it on the museum’s website. I highly recommend it. I’ve been to the Air and Space Museum a couple of times before. I’ve found that it’s good the first time you visit or if you have children who are into science. Otherwise, it’s not really my thing. I enjoyed the movie quite a bit. As one would expect, the visuals are amazing — especially the ones of the astronauts working on the telescope in space. Seeing them tethered to the space shuttle while the earth lies below (or is it above) them, is thrilled and beautiful and would be worth seeing this movie even without the narrative. But the narrative is good too, except for one problem: the film ends with a lengthy description of what Hubble has taught scientists, which is a lot, but it doesn’t come back to where the first part of the film began, i.e., with the astronauts. I think a short segment at the end where we experience what it’s like to land the shuttle would have been a perfect (and more satisfying) conclusion to the documentary. I only walked around the museum during the 20 minutes or so that I waited before seeing my movie, so I didn’t see a lot of the exhibits. Like I said, I’ve been there at least twice before. But I enjoyed the little I saw. I’ve been to the American History Museum a couple of times before too. It turns out that I have rather strong feelings about this museum. In sum, I think it needs to be completely overhauled. Let’s start with the good. The museum has finished restoring its nearly 200-year-old American flag and is now displaying it in a new exhibit devoted to the Star-Spangled Banner and the National Anthem. The flag looks amazing, and the exhibit space achieves its two main goals well: show off the flag while preserving it and educating viewers about its creation and the national anthem. I do have one complaint about this exhibit, however. In order to preserve and display the flag well, the observing area is rather dark, allowing us to see the flag, which is lit with very low lighting. To exaggerate slightly, this creates a seeming deathtrap for visitors. You can’t see the people around you, and you especially can’t see their roller bags and strollers. This means that everyone is constantly bumping to and tripping over each other as they make their way through the observation area. I tripped over someone’s small roller bag — who brings roller bags to a museum anyway and why were they allowed to bring them through the exhibits?! My viewing of the flag was accompanied by a constant chorus of “excuse me,” “sorry,” and “pardon me,” as the people around me bumped into each other. The museum needs to find a way to light the visitors a little more to avoid this. The other exhibit that is always a crowd-pleaser is the display of the First Ladies’ inaugural gowns. It’s fun to see how styles have changed over the past couple hundred years, of course. It’s also fun to see how differently sized the First Ladies have been. 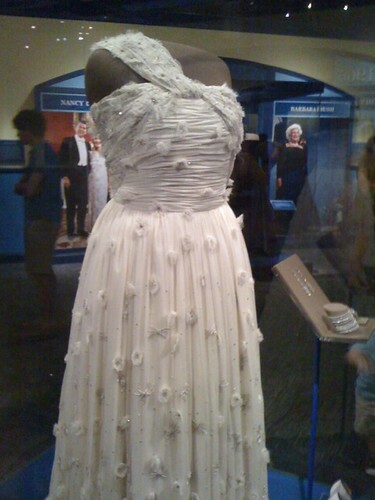 This is Michelle Obama’s gown, for example. I was struck by how much larger a person she is than many of the previous first ladies. She’s clearly much taller and more Amazonian, especially when compared to someone like Nancy Reagan. If her dress is any indication, Mrs. Reagan is both one of the shortest First Ladies ever and one of the thinnest. I was reminded that she was also (presumably) one of the oldest, which might also explain her thinness. Everyone in this gallery was chatting enthusiastically about these gowns and comparing one to another. It was a lot of fun. But I also think it’s a problem that the best and most interesting exhibit in the American History Museum is one on the First Ladies’ gowns. Overall, I think this museum us incoherent, dated, far too random, and difficult to navigate. I don’t get a sense of American history by visiting this museum; instead, I get random exhibits seemingly about whatever the museum could get someone to donate or could purchase. As interesting as Julia Child’s kitchen might be to some people, it doesn’t have a lot of cultural relevance today and doesn’t really tell us much about American history, it seems to me. Overall, the Museum of American History is moving in the right direction, but it still needs a lot of work. I hope it undergoes a major rehaul at some point in the near future. I’ll pick up on the next three museums tomorrow.